At the heart of the Cascina the fully equipped, two-storey apartment /cottage retains much of the original 300 year old structure and has been sympathetically refurbished around original features. Designed for four people, it has two spacious double bedrooms, one includes a large four-poster bed and the other has two single sleigh beds. There is also a bathroom with bath, separate shower cubicle, bidet, sink and WC. The first floor balcony is accessed from the central landing. On the ground floor there is a sitting room with TV/satellite channels and DVD player, cloakroom. Fully appointed kitchen/diner with built-in oven, gas hob, fridge/freezer, microwave, washing machine, toaster & kettle. Extensive range of cooking utensils, crockery and cutlery provided. Expressly designed to provide you with a stylish, tranquil and natural space to enjoy. La Granica is intimate and unique. Amidst the beautiful Piedmontese countryside La Granica nestles into the hillside of a secluded valley, immersed in the peaceful and inspiring surroundings of its own vineyards, woods and meadows. It is the perfect retreat in which to unwind, relax and enjoy or a base to discover everything that Piedmont has to offer. This accommodation is principally designed in a contemporary style using natural materials providing a luxurious modern environment with oodles of space, designer features and modern facilities. La Granica offers accommodation for both large and smaller groups offered on a self-catering basis. As part of the Kitchen / Diner. Table can be extended and comfortably seats 6. Notes on accommodation: The cottage is serviced prior to arrival and every 7 days during longer stays. The Cottage has independant central heating control. Children are welcome. For very small children Cots and High Chairs are available. Smoking is not permitted inside or in the grounds. Sorry, no pets. 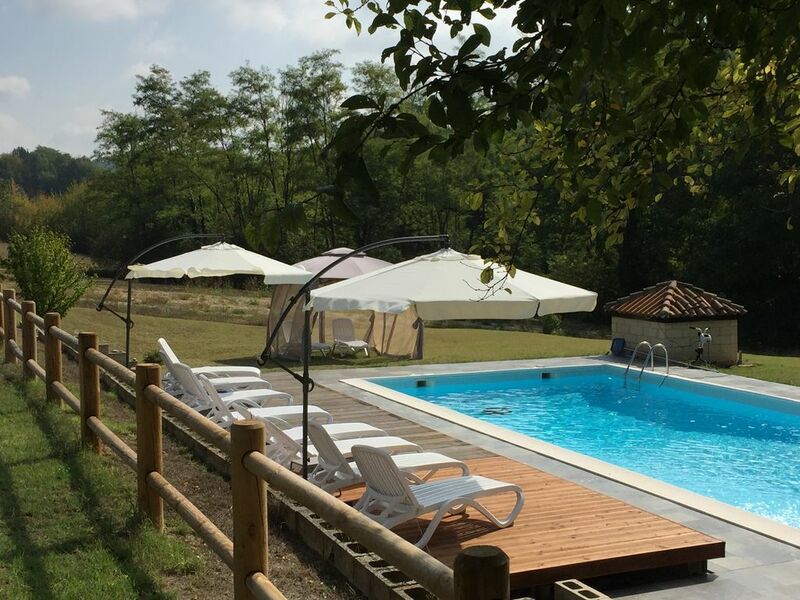 Outside: We have a beautiful rectangular 12m x 5.5m pool, which is private to the Cascina. (depths 100cm step to 200cm) There are 7 hectares of our own vineyards, woods and meadows surrounding the property of what is still a working farm. From the initial welcome from Mark to the departure farewell, we really enjoyed our time in La Granica. Quiet, clean and with well-functioning appliances. We appreciated that Mark had purchased basic necessities for us prior to our arrival (including local wine) as we came in late when all stores were closed. mosquito nets at the top floor windows were a nice touch given the steamy July weather in Italy. The pool was nice, although the wasps could be bothersome at times. There is not much in Fontanile but Nizza and Acqui are close enough to get all needed things quickly. We recommend the property. Just over an hours drive to the Ligurian coast at Genoa where you can travel East or West along the Italian Riviera to Portofino or Savona. A car is essential, firstly to travel from the airports and then to explore this rural region. The local village is Fontanile 10 minutes walk from the cascina. The local market town is Nizza Monferrato 5km away. Historic towns of Asti and Alba 25-30km. Our nearest town Nizza Monferrato contains the full range of shops, banks and cafes/restaurants. Frequent markets in the large Piazza. A train station with a line to Asti and Alessandria. The owners reside on-site and maintain the property. Booking Notes: Use the Booking form on this website or call direct. Deposit: 30% within 5 days of the booking confirmation Balance: Paid on or before 14 days prior to Arrival We can accept credit/debit card payments (Mastercard & Visa), Bank Transfer or with Cash for balance payments No set Changeover Day: Min Stay 3 nights. Check-in after 15:00, Departure by 11:00 although flexible by prior agreement. Notes on prices: Min stay 3 nights in the Cottage. More discounts available for longer stays.